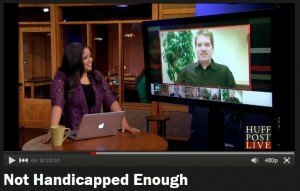 The Invisible Disabilities Association has been in the news across the globe! We have been in hundreds of publications such as newsletters, newspapers, magazines, news sites and websites. 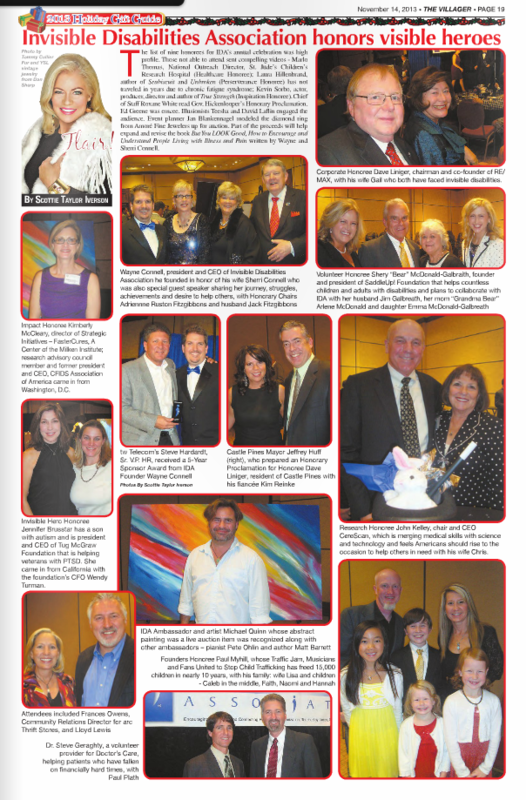 Here is just a sample of the exciting print news coverage we have enjoyed. Being Sick Well, by Jeffrey Boyd, MD wrote about IDA in his section called, Strategy Twenty: Use Your Suffering to Help Others in 2005. God Made Only One of Me by Dr. Diane Dike listed IDA in their resource section in 2008. The book is available through Second Chance with Saving Grace. Inside Every Chronic Patient is An Acute Patient Wondering What Happened by Marcus Brown Ph.D contained information about IDA’s outreach which was published in the Journal of Clinical Psychology on November, 11, 2002. Living Beyond Multiple Sclerosis by Judith Lynn Nichols, listed IDA in their Resources section in 2000. Sick and Tired of Feeling Sick and Tired by Paul J. Donoghue, Ph.D. and Mary E. Siegel, Ph.D., listed IDA in their Resources section in 2000. Striking Back! The Trigeminal Neuralgia and Face Pain, by George Weigel quoted from our book, But You LOOK Good! in their “Helping People” chapter. The book is available through the Trigeminal Neuralgia Association. 2004. Why Can’t I Make People Understand? by Lisa Copen quoted from our book, But You LOOK Good! in 2004. The book is available through Rest Ministries. Video contest Raises Awareness for ‘Invisible’ Diseases Like Fibromyalgia. Carolina Henriques. Fibromyalgia News Today. February 21, 2018. Video contest Urges People with ‘Invisible’ Diseases to say #IAmInvisibleNoMore. Carolina Henriques. Lupus News Today. February 21, 2018. Win $500 and a Trip to Denver Just Because We Believe You! Allsup. All Things Disability. February 14, 2018. Video Contest Urges People with Invisible Disabilities to Declare #IAmInvisibleNoMore. True Help. A Division of Allsup. February 13, 2018. #IAmInvisibleNoMore. The Calvert Kielder & Calvert Trust Kielder Blog. February 1, 2018. Invisible Disabilities Association Video Covers Disorders That Many Can’t See Signs Of. Carolina Henriques, Lupus News Today. January 23, 2018. Online Video Aims to Show How ‘Invisible’ Disabilities Affect Lives. Magdalena Kegel, Multiple Sclerosis Today. January 23, 2018. Video on Invisible Disabilities Breaks Down Barriers and Helps Make Connections. True Help, a Division of Allsup. January 18, 2018. The Top 5 Reasons You Need to Watch This Video. Wayne Connell. Allsup. January 18, 2018. 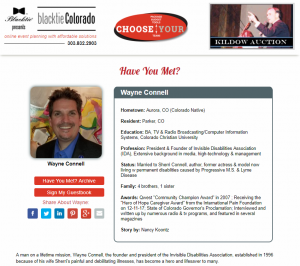 Have You Met Wayne Connell? Nancy Koontz. Blacktie Colorado. November 2017. Invisible No More. Denver Life Magazine. Joanne Davidson. May 2016. I Resolve to Believe You. Wayne Connell. Disability Blog by Disability.Gov. January 20, 2016. 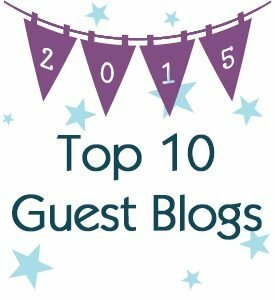 Top 10 Guest Blogs of 2015. Disability.gov Team. Disability Blog by Disability.Gov. December 2015. Brain IDEAS: It’s All in Your Head. Wayne Connell. Disability Blog by Disability.Gov. August 20, 2015. The Voice of Encouragement. Wayne Connell. Disability Blog by Disability.Gov. June 24, 2015. Parking lot vigilantes abuse woman with ‘invisible’ disability. Sun Sentinel. David Fleshler. January 2, 2015. Top 10 Guest Blogs of 2014. Stephanie Bostaph. Disability Blog by Disability.Gov. January 02, 2015. A Hope to Believe. Wayne Connell. Disability Blog by Disability.Gov. December 3, 2014. It’s Not a Laughing Matter. Wayne Connell. Disability Blog by Disability.Gov. October 17, 2014. Lift Up, Not Tear Down. Wayne Connell. Disability Blog by Disability.Gov. July 25, 2014. The Loneliness of Illness and Pain. Wayne Connell. Disability Blog by Disability.Gov. May 9, 2014. My Disability May Be Invisible, But I’m Not! Wayne Connell. Disability Blog by Disability.Gov. April 16, 2014. It’s Your Own Fault. Wayne Connell. Disability Blog by Disability.Gov. January 13, 2014. Don’t Miss the Top 10 Guest Blogs of 2013. Disability.gov Team. Disability Blog by Disability.Gov. December 31, 2013. Invisible Disabilities Association awards dinner: Photos from the evening. The Denver Post. Mile High Style. Joanne Davidson. Photographer: Steve Peterson, Special to The Denver Post. November 17, 2013. Invisible Disabilities Association honors its champions. The Denver Post. Mile High Style. Joanne Davidson. Photographer: Steve Peterson, Special to The Denver Post. PDF. November 17, 2013. Wayne Connell, founder of the Invisible Disabilities Association and his wife, Sherri. The Denver Post. Joanne Davidson. Photographer: Steve Peterson, Special to The Denver Post. November 17, 2013. You’re So Needy. Wayne Connell. Disability Blog by Disability.Gov. November 14, 2013. Invisible Disabilities Association honors visible heroes. The Villager Newspaper. Scottie Taylor Iverson. Page 18. November 14, 2013. 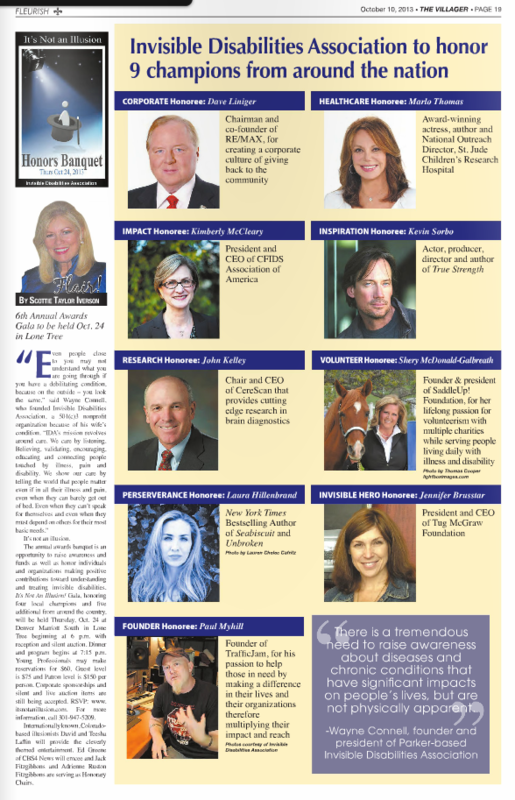 Invisible Disabilities Association to honor 9 champions from around the nation. The Villager Newspaper. Scottie Taylor Iverson. Page 19. October 10, 2013. Etiquette: Follow-up story. The Villager Newspaper. Fleurish section by Society editor, Glory Weisberg. October 2, 2013. Etiquette. The Villager Newspaper. Fleurish section by Society editor, Glory Weisberg. Page 13. September 19, 2013. Truly Caring is Healthy. Wayne Connell. Disability Blog by Disability.Gov. August 14, 2013. Celebrating the Bravery of Heroes with Invisible Disabilities. Wayne Connell. Disability Blog by Disability.Gov. July 2, 2013. Friendships Over Fragrances. Wayne Connell. Disability.Blog by Disability.Gov. April 29, 2013. A Love That’s Unbroken. Wayne Connell. Disability.Blog by Disability.Gov. February 13, 2013. IDA Receives the “Best Booth Award” for Allsup’s Disability Expo. Allsup’s True Help® Disability Web Expo. Allsup. January 2013. IDA Makes the “Top 10 Guest Blogs of 2012” on Disability.gov. Disability.Blog by Disability.Gov. January 2, 2013. The Visible Invisible Disability. Wayne Connell. Disability.Blog by Disability.Gov. December 21, 2012. A Tick Bite Changed My Life Forever. HUFFPOST LIVE by THE HUFFINGTON POST. Guests Wayne and Sherri Connell. Video. Not Handicapped Enough. HUFFPOST LIVE by THE HUFFINGTON POST. Guests Wayne Connell, Karyn Buxman, RN, MSN, Sherri Connell. Also with Elsa S. Henry. December 11, 2012. Video. Being Truly Thankful. Wayne Connell. Disability.Blog by Disability.Gov. November 30, 2012. Don’t Judge by Appearances. Wayne Connell. Disability.Blog by Disability.Gov. October 31, 2012. Join the Expedition. Wayne Connell. Disability.Blog by Disability.Gov. September 19, 2012. What’s So Funny About … . Wayne Connell and Karyn Buxman. Disability.Blog by Disability.Gov. August 24, 2012. Looks Can Be Deceiving. Wayne Connell and Kathy Skinner. Disability.Blog by Disability.Gov. July 25, 2012. It’s All in Your Head. Wayne Connell and Jeff Vankooten. Disability.Blog by Disability.Gov. May 30, 2012. But You LOOK Good – Learning the Language of Invisible Disabilities. Wayne Connell and Antarctic Mike Pierce. Disability Blog by Disability.Gov. March 14, 2012. Advocating for invisiAbilities. The McGill Daily. Ethan Yang. January 12, 2012. Invisible No More. Disability Blog by Disability.gov. Published article by IDA Founder and President, Wayne Connell. January 4, 2012. Living with Unlimited Purpose. Allsup Blog. Allsup, Inc. Tai. October 14, 2011. Allsup Applauds Work of Invisible Disability Association. Allsup, Inc. Allsup Place. October 2011. Parker Couple Brings Hope to Millions Around the World Living with Debilitating Conditions. Denver Post: Your Hub. September 22, 2011. Disabled Littleton Woman to Receive Award in October. Denver Post: Your Hub. September 29, 2011. Spotlight Shines on Invisible Disabilities Champions. Press Release. September 18, 2011. Parker Volunteer Honored. Colorado Community Newspapers. Douglas County News Press. Parker Chronicle. Ashley Dieterle. October 14, 2010. ‘But You Look So Good!‘ and 7 Other Things NOT to Say to a Person with a Non-Visible Disability. Diversity Inc magazine. Robyn Heller Gerbush. August 2007, Site Update July 26, 2010. Social Networks a Lifeline for the Chronically Ill. New York Times. Claire Cain Miller. March 24, 2010. Spotlight Shines on Invisible Disabilities Champions. Press Release. September 30, 2010. Non-profit supports invisible disabilities. Colorado Community Newspapers. Douglas County News Press. Ashley Dieterle. October 2009. Parker Resident is Founder of World Wide Outreach. Denver Post: YourHub. October 9, 2008. Disability Benefits Resources. CBS News.com. Christine Lagorio. January 14, 2008. Social Work Today. Jennifer Sisk, MA. Invisible Illness – What You Can’t See Does Hurt Her. Nov/Dec 2007. Invisible Disability. Colorado Community Newspapers. 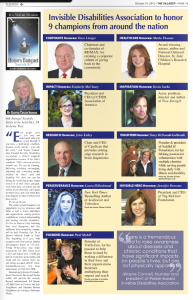 Elbert County News, Douglas County News Press, Castle Rock News Press, Parker Chronicle. Rhonda Moore. April 2006. A healthy appearance leaves those with chronic illness searching for support and compassion. Search Parker Magazine. Carrie Hobbs. April 2006. Simple Advice. ADVANCE for Audiologists magazine. ADVANCE Newsmagazines. Sept/Oct 2005. The Disabilities are Invisible, the Outreach Isn’t. HopeKeepers Magazine. Lisa J. Copen. Rest Ministries. September/October 2004. Knowledge is Power! Educate the Masses! Multiple Sclerosis and Its Challenges. S.W. Hussey. June 2002. Senior Outlook: Invisible Disabilities. SeniorCare of Massachusetts. Anne Springer. May 2002. Investigative reporting Health Story: Hidden Disabilities. Kwantlen Chronicle. Eric J. Welsh. Vancouver, British Columbia. March 8, 2002. Coping with Invisible MS. The Avonex Alliance. Avonex. December 2000. For Family and Friends: How You Can Help. MS Focus. Multiple Sclerosis Foundation. Adapted from writings of Sherri L. Connell. Winter 1999.